The PicoDuino is an ATtiny85 based microcontroller development board similar to the Arduino line highly inspired by DigiSpark , only cheaper (if you add price of any shield, because all arduino boards is unusable without shields, Picoduino integrating I2C pull-up, relay driver and RGB led). With the ability to use the familiar Arduino IDE ( Digispark version is highly recommended ) the PicoDuino is a great way to jump into electronics, or perfect for when an Arduino is too big or too much. Because Picoduino have boootloader, you do not need any Arduino board or programmer for upload your sketch, just plug in to your computer and have fun. Picoduino is hardware compatible with Adafruit Trinket / Gemma but due to restriction of selling boards with adafruit vid/pid you we can't sell boards wit gemaboot, you can replace yourself. I believe the PicoDuino is the smallest complete development platform in the world. On-board RGB led - no shield required !!! 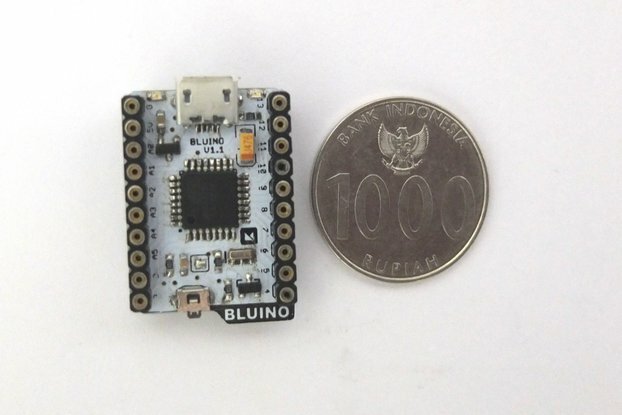 smart pinout ... direct connect I2C/TWI boards, RTC, EEPROM, Led strips, I2C LCD - no shield required !!! partially breadboard compatible, you can insert 1 row, if you need more breadboard friendly board - Check out my other items! optional Transistor with diode for driving small motor or relay on PB1 max 100mA - no shield required !!! 1pcs development board with preloaded bootloader compatible with Digispark IDE. The PicoDuino is powered by an Atmel Attiny85 MCU - this has many differences from an Arduino's ATmega328 and some libraries may not work correctly on it. The PicoDuino only has about 6 KB of flash memory for storing your code. 8kb if you remove bootloader. 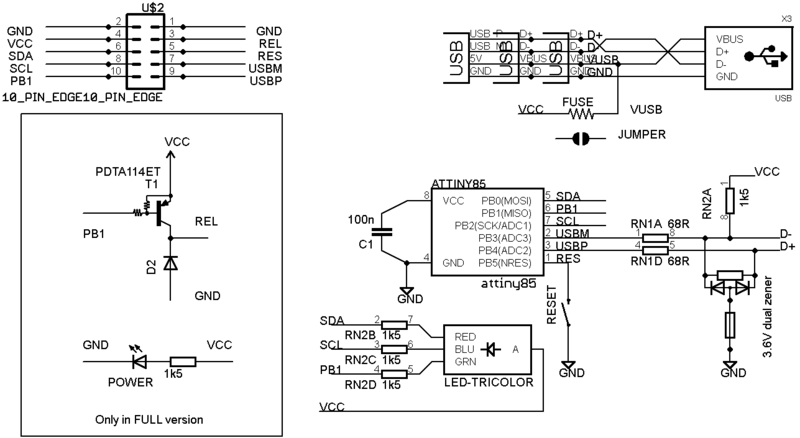 Pin 3 and Pin 4 (P3 and P4) are used for USB communication and programming, while you can use them in your circuit if you are not using USB communication, you may have to unplug your circuit during programming if the circuit would impede the pin states or dramatically affect the voltage levels on these pins. Pin 3 (P3) has a 1.5k pull-up resistor attached to it which is required for when P3 and P4 are used for USB communication (including programming). Your design may need to take into account that you'd have to overpower this to pull this pin low. The PicoDuino does not have a hardware serial port nor a hardware serial to USB converter. An example library (DigiUSB) is provided, as well as some example code and a serial monitor like program, but communication with the computer will not always be plug and play, especially when other libraries are involved. The PicoDuino supports all features found in the IDE with the exception of the serial monitor and the burn bootloader functionality. 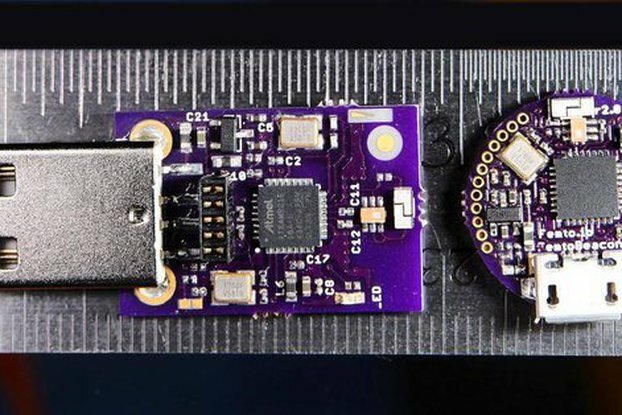 Many existing libraries will not work with the Picoduino: For I2C devices check out the TinyWireM library, which makes it super simple to port an I2C based device library over to use with the PicoDuino. Try connecting it to another USB port or system. Try connecting it to a USB hub. Try a powered USB hub. A review from a noob arduino user. The PicoDuino was quickly delivered (3 days bubble envelope). A header and a small plastified lookup table is a nice side delivery in the package. The PicoDuino is an excellent starter device. Smaller than a trinket, directly USB connected, no cable hassle. Bright, BRIGHT rgb led. Nicely engineered and goldplated for good contact. Highly recommendable for starter or starter project. Do remember you can program it in arduino by clicking upload and only then plugging it in... Some beginners documentation step by step might be welcome. I can't give a fair review as I cannot communicate with the device. I cannot program it even following the tutorials online. The seller responded quickly but only to say he cannot help because he doesn't own a Macintosh. This processor is SMD and soldered so cannot be removed to try programming it externally. Unfortunately, I chose this particular model Attiny85 to try as my first experience with Attiny85. The seller has many different configurations and possibly I might have had success with other a different setup. So consider this review "Neutral". I am thing that we are together solved problem :) It is usable for Mac but id need some tweaks. Agree? This is so well cared for, very neat. It is small and solid. PCB of high quality. I love this product more than the Digispark. Thanks for this. Purchased to control a simple set of switches. Can't get Windows 7 to recognize the device at all, tried for hours. Not sure if it's a dud or if I'm missing something, documentation is sparse. Contacted the seller via Tindie response form, no response even after a couple weeks. I answered, you but not response from you, I offered you refund or new. But you not answered my !!!! It is a useful wonderful device, that works great. I used Digispark to documentation and libraries to make a one key Keyboard.